The mortgage loan department of a large regional bank has 400 loan officers, each of whom manage 20-30 active loan applications at any given time. As part of the process, applicants need to provide supporting documentation such as prior tax returns, photo IDs, bank statements, construction plans, etc. Each month the bank processes 130,000 associated documents, which contain private sensitive information. Due to industry regulations and size limitations these cannot be sent via email, so applicants need to either fax, use a courier, or drive to a local branch to deliver these documents. File Transfer Protocol (FTP) is not a viable solution since the loan officers use one shared account, which is subject to confusing subdirectories, permissions, and file misdirects – slowing business down. And collating paper documents proves to be inefficient and unwieldy for the loan officers. Slower processing leads to slower deal flow, which leads to fewer profits for the bank. DataMotion SecureMail with SecureContact.me allows each loan officer to have a customized mini portal with an easy to use link that they can distribute to their client base. This allows an applicant to safely send messages and files up to 100MB directly to their loan officer from any computer or device. The loan officer receives a notice whenever a file or message has been uploaded by an applicant. 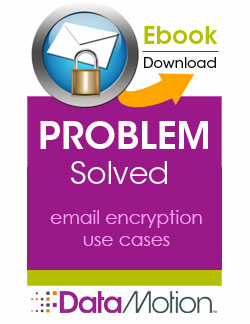 They can simply download the documents to their desktop and carry on encrypted email dialogue with applicants. And since the messages and files are always encrypted in transit they comply with industry and bank security regulations. Finally, senior management can view detailed activity from all users for verification and accountability.